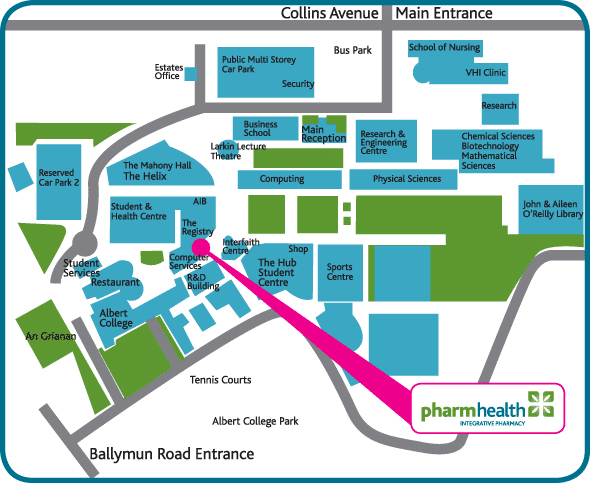 Pharmhealth Pharmacy is situated at the heart of Dublin City University, Glasnevin, Dublin 9. We welcome everyone to our doors, students, staff, local residents and visitors to DCU. For those of you familiar with DCU; we are at the top of the Mall, just opposite the Inter Faith Centre. Access to the campus is easy; either via the main entrance on Collins Avenue, or from the Ballymun Road entrance, use the lane beside the student “Hub” – just opposite Albert College/Hampstead Park. For further information on our general whereabouts in Dublin please see the location map below.